It has been awhile since I have mentioned one of my favorite subjects, fill flash. I touched on fill flash when I discussed Outdoor Portraiture and shared a photo of Captain Jack Sparrow. Even with the advancements of my Nikon D700 digital SLR camera, I still use a Nikon Speedlight set to balanced fill flash (see your camera and flash manuals for this setting. Point and Shoot camera owners, look for Sun Portrait or similar mode). Photo on left is with no flash; photo on right is with fill flash. 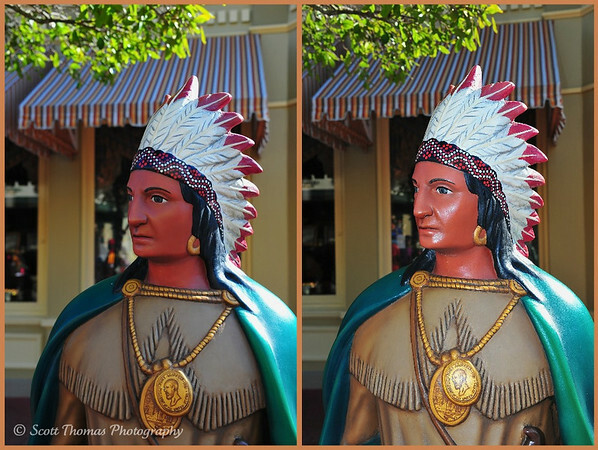 This Indian statue on Main Street USA in the Magic Kingdom of Walt Disney World was a willing subject to show you the difference between not using and using flash in bright sunlight. The photo on the left without flash has dark shadows and muted colors. The photo on the right with flash brings up the colors and eliminates the shadows. Especially notice the difference around the eyes. Before you mention it, I know there is some reflection from the flash on the statue’s face. I do not expect that to happen with real people unless you are photographing Joan Rivers or Wayne Newton. 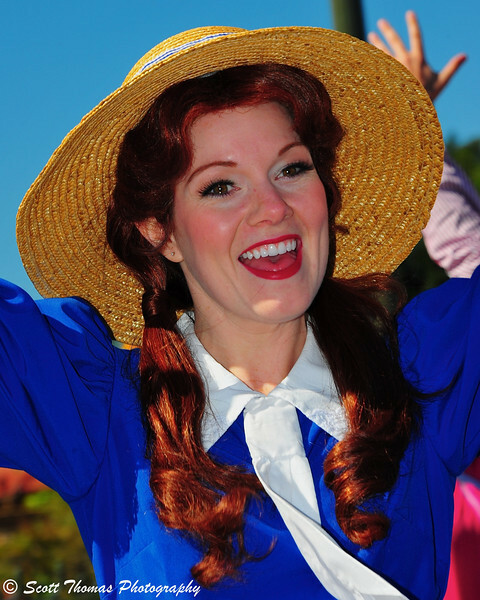 😀 To prove my point here are a few more portraits of some of the characters found on Main Street USA. A performer in the Main Street Trolley Parade show in the Magic Kingdom. Nikon D700/28-300VR, 1/250s, f/14, ISO 200, EV 0, 180mm focal length, balanced fill flash set at -1 power. 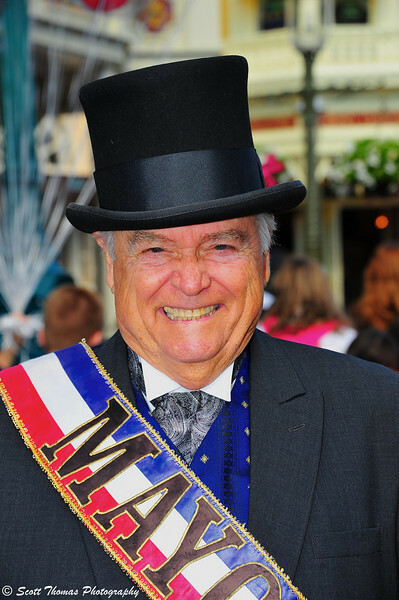 The Mayor of Main Street USA in the Magic Kingdom. Nikon D700/28-300VR, 1/250s, f/8, ISO 200, EV 0, 112mm focal length, balanced fill flash at -1 power. 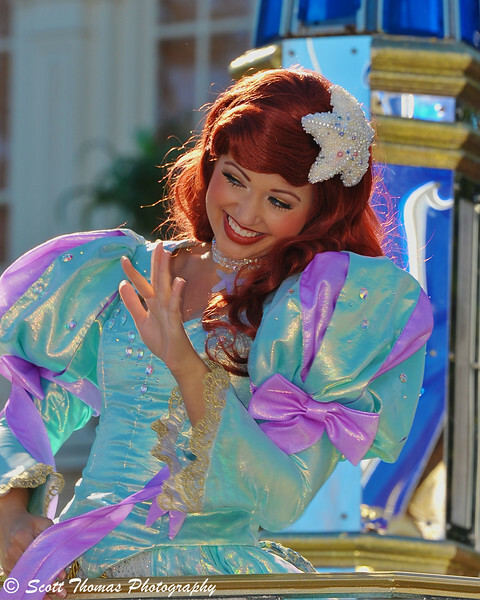 Princess Ariel waving to her admirers during a parade on Main Street USA in the Magic Kingdom. Nikon D700/28-300VR, 1/250s, f/10, ISO 200, EV 0, 300mm focal length, balanced fill flash at full power. Notice when I am in close to the people, I set my flash at -1 power. That is a good starting point. I will change the power plus or minus until I get the best exposure possible. The last photo of Princess Ariel, I needed full power because of the distance she was from me. This entry was posted in People, Photography and tagged 28-300mm, ariel, cast member, characters, dancer, entertainer, fill flash, florida, magic kingdom, main street usa, mayor, nikon D700, orlando, princess, sb-600, singer, statue, vr, walt disney world. Bookmark the permalink. I think your people photos turned out great with fill flash, esp. the first one, where you were able to get catchlights, too. I’m going to mention the statue anyway 🙂 because I MUCH prefer the one without fill flash. The reflection of the flash is just too distracting to me, and makes it LOOK flashy (unlike your people pictures, you can’t really tell that flash was used) and I think you would have been better off lowering your shutter speed to allow for more light on your subject and avoid the reflection. Another plus for fill flash is getting those nice catchlights. Yep, it does look flashy which is why I mentioned it. I do not think using a slower shutter speed would have worked. Would have made it even more flashy looking. The best solution would have been to take the flash off the camera (hi, KD!) and put it high off to the camera’s left. I took this photo with and without fill flash (I love digital). The day couldn’t have been any brighter but the topiaries were in shadow. Without the fill flash they would have been silhouettes (not a bad choice, but not the one I wanted). With fill flash you can see the color and texture of the plants. Another excellent use of flash during the day. Shadows on such days can be too dark and really look bad when there is brightness behind, too. Your flash not only filled in the shadow but helped to balance the light in the background. Good point well made – especially for formal portraiture. But I wouldn’t like to try it for street photography, though there is one photographer (forget his name) who jumps out in front of his victim (best description) and uses a flash to capture the surprised look on their face. Food for thought. I wish the P&S options weren’t buried in menus, because I’d often like to take several versions of a particular thing quickly. By the time I squirrel around the dogs have disappeared around the corner and I have to track ’em down. I use fill-flash all the time and like you, I typically dial it down a bit. I never like things to look ‘flashed’. For me, the Mayor shot is the most successful. Nooooo, was a redhead myself at one point! I just think the Main Street performer is a bit overflashed (tho her expression is fantastic) and Ariel, well, nothing engaging (for me) in that photo. Hmmm…I did overflash others so I thought her photo was pretty good. Anyway, I do love her expression so I will take another shot at processing to see if I can get a more natural look. You can for Nikon popups…you can control when the flash occurs (front or rear sync) and how much power (+ or -). I am sure you can for Canons, too. Flash is like taking a paintbrush of light and, hopefully, dabbing it on the subject. Hard, sometimes, to keep it from splashing. I like your street portraits. I didn’t know that you could tune down the flash, here I’ve been using it at full blast. 🙂 Thanks for the tips. You’re welcome, Nye. Have fun experimenting! Nice job with the fill flash, Scott. I had a chance to use mine just this past Friday. You’re welcome, Karen! Thanks for stopping by.